In recent years, no matter where one turns, the role and relevance of networking is increasingly becoming important. This is certainly true in the world of arts and cultures, and vital for a small organization such as the Sainsbury Institute. Including all the permanent staff, both academic and administrative, we are a group of no more than ten people. When we began we were even smaller! Furthermore, in the 1990s Norwich was not the obvious place to start an academic institute specialising in Japan. It took more than ten years after the Sainsbury Institute was founded for the University of East Anglia to start offering degree level Japanese language courses. As such, teaming up with key connections in Japan and with established British organizations was vital for the successful launch of the Institute. The Lisa Sainsbury Library, which is now one of the most important libraries in Europe for material concerning Japanese arts and cultures, was established with donations from prominent Japanese scholars in the field. Here in the UK, the British Museum and the School of Oriental and African Studies in London were our main partners from our inception and remain so today. We have written agreements on cooperation with both institutions and have carried out numerous projects with them. Exhibitions such as ‘ Crafting Beauty’ and ‘The Power of Dogu’, both held at the British Museum, are only some of the fruits of our partnership. Until recently, we had a London Office with a SOAS academic as the Head during the first decade. Several years ago when I was introducing myself at a reception, explaining who I was and what we did at the Sainsbury Institute, the response was that indeed people were very aware of the SOAS branch of Japanese art studies in Norwich! The relationship was surely seen as a close one. Fortunately, as I wrote in the previous issue of our e-magazine, our association with the University of East Anglia has grown over the years and it will only become stronger from now on with the creation of the Sainsbury Institute for Art. Another important aspect of our Institute’s networking efforts is being realized through our various fellowship and scholarship schemes. You may have been reading letters from our former Robert and Lisa Sainsbury Fellows posted in this e-magazine. This Fellowship started in 2001 when Lord Sainsbury decided to establish it as a gift to his parents. To date, nearly forty academics have benefited from this scheme, which allows them time and funding to purse their research, complete manuscripts and further their careers. The fellows arrive from all over the world including here in the UK, Europe, Japan and the United States. The majority are young scholars who have recently obtained their PhDs. Securing an academic job is not easy, to say the least, as the number of posts at higher institutions which offer teaching Japanese arts and cultures is not large. Against this backdrop we are exceedingly pleased to note that the Institute serves in a capacity which allows many of our fellows, after spending time in Norwich, to go on to teach at leading universities. 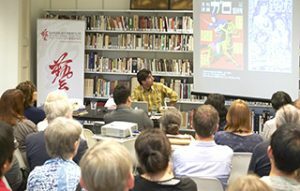 It is also frequently the case that when a large international conference on Japanese arts and cultures is held many of the speakers come from the pool of our former fellows. Starting four years ago, fellows are now all based in Norwich instead of in London, as was the case when the scheme started. They all deliver a Third Thursday Lecture, our flagship outreach program, and some of them organise workshops and conferences. These events and the presence of the fellows alone in the building, create an academic vibrancy at 64 The Close. This year we have welcomed a record number of five Sainsbury Fellows to Norwich, and it is becoming rather challenging to find desks for all of them. This is testimony to how successful we have become in running this scheme. Supporting scholars so that they can pursue their careers and contribute to sustaining research and teaching is at the core of our mission. Most significantly, once the Fellowship is over, most of our academics continue to be associated with the Institute in one way or another and become an integral part of our worldwide network. Another important fellowship we have been running is the Handa Archaeology Fellowship. With a generous donation from Dr Handa Haruhisa, offered through the International Jomon Cultural Conference he heads, this Fellowship offers the unique opportunity for Japanese young scholars in the field of archaeology to spend a year in the UK. While internationalisation of the discipline remains an ongoing challenge for Japanese archaeology, there is no better way to achieve this objective than by sending abroad promising young scholars in the field. Dr Matsuda Akira, who teaches subjects related to cultural heritage at the University of East Anglia, is a former Handa Archaeology Fellow. Other fellows have gone back to Japan to dig at archaeological sites in Japan or to teach at universities. We also have a scholarship scheme for senior Japanese art historians, the Sotheby’s Senior Scholarship. The Institute’s relationship with Sotheby’s, the renown international auction house, goes back to the very beginning of our history. The endowment of the Institute was established with the sales of a Modigliani painting that Sir Robert and Lisa Sainsbury sold at Sotheby’s for this purpose and this scholarship is a byproduct of that wonderful gesture. 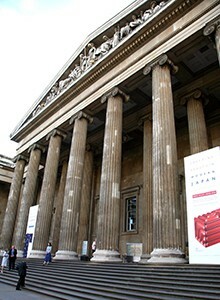 Each year at the time when the senior scholar visits the UK, Sotheby’s hosts a luncheon which Lord Sainsbury attends. This moment serves as an important annual occasion for the Institute to renew our gratitude towards Lord Sainsbury and the late Sir Robert and Lisa Sainsbury. 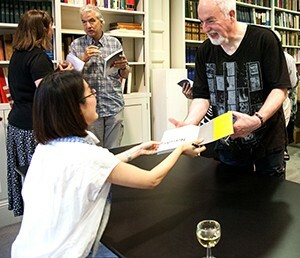 For the senior Japanese scholar, his/her brief period away from their duties back at home, visiting museums and mingling with academics in the UK and Europe regularly becomes a most memorable experience. They all return to Japan acknowledging the unique role the Institute plays in promoting Japanese arts and cultures from the UK and with a renewed vow to work closely with us to this end. A recent lecturer who visited the Institute from the United States was amazed at the number and wide variety of activities taking place at the Institute. She was even more surprised to see all this occurring given the small size of our team. I firmly believe that the key to our success owes a lot to the networks that we have been diligently building. In addition to the fellowship and scholarship schemes I have written about, in recent years we have also expanded the number of collaborative partners with Japanese universities and institutes. Our Friends’ scheme is yet another way to extend our network. The process of networking is endless and its power ever so important.